The refrigerator gurgles and hums, the soft vibrato of the compressor like a brook on rocks; somewhere upstairs a neighbor runs their kitchen tap and the water rains down the building’s pipes, and I hear the gentle rumble of bare feet on wood floors; the hard disc of my laptop whirs as it awakens like a bird winding up to a long mating call. 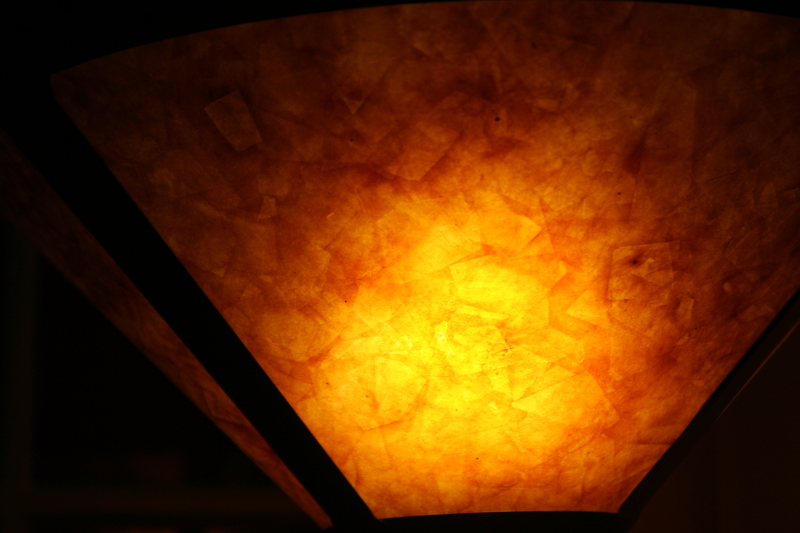 The amber lampshade the color of a sunset. This is a feast of similes, my favourite is the whir of the hard disk ‘like a bird winding up to a long mating call’. Thank you, Marie! That is high praise! I’m really glad you commented, actually: I’ve let my stones slide lately and have been meaning to take them up again. Nothing like a compliment to prod one into writing something! You’ve also reminded me how much I’d love to visit Scotland again. I’m loving your blog, the richness of your imagery, the rhythms of your language! I especially like the “I am an American” series. All of which, of course, makes me interested in your poetry collection — I’ve added it to my to-read list. Thanks for the tip — I’ll add it to my list of books to buy! Love your bio! It’s so ethereal yet so concrete, so vivid.